Be sure the parking brake is fully released before driving. Failure to do so can cause brake failure and lead to an accident. Do not release the parking brake from outside the vehicle. Do not use the shift lever in place of the parking brake. When parking, be sure the parking brake is fully engaged. Do not leave children unattended in a vehicle. They could release the parking brake and cause an accident. To engage: Pull the parking brake lever up A . Firmly apply the foot brake. Manual transmission models: Place the shift lever in the N (Neutral) position. 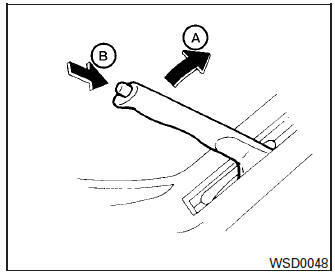 While pulling up on the parking brake lever slightly, push the button B and lower the lever completely . Before driving, be sure the brake warning light goes out.